I haven’t made these before but they look so cool that I just had to try them out, and they’re pretty simple too. These, and most of the Christmas cookies I make annually are from an ancient, well-loved copy of A Guide to Good Cooking by Five Roses Flour. I have no idea how old it is since there is no publishing date in it and all I can find out online is that the original copyright date was 1938 (the book does say it’s the 21st edition, published and copyrighted by Lake of the Woods Milling Company Limited, Montreal, Winnipeg). There is a handwritten note on the inside front cover from my Mom to me, to say that this book was given to her by my great grandmother when she was a little girl, and that it’s the book she learned how to cook out of when she married my Dad (she knew only how to fry eggs then, and she’s an excellent cook now, and taught me how, too). So it’s especially precious to me. In a small bowl, sift together flour, salt and baking soda. In larger bowl, cream butter. Gradually add brown sugar and cream well. Add egg and vanilla and beat well. Stir in dry ingredients. Use your hands to mix when dough gets thick. Divide in half and combine cocoa powder with one half of the dough. Starting with the vanilla half of dough, turn onto lightly floured surface and shape into a rectangle, rolling out to approximately 1/4 inch thickness. Do the same, separately with the chocolate half. Carefully lay the chocolate dough on top of the vanilla dough. If it splits, don’t worry – just patch it up as best you can. While still flat, gently roll together the doughs with a rolling pin to help “join” the two halves and push out any air spaces. Be careful not to apply too much pressure. Beginning at one end, roll up the two halves into one jelly-roll log, again taking care to try to press out any air pockets as you go. 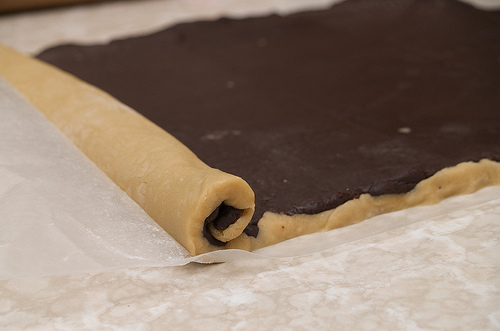 Once rolled up, shape the dough into a smooth log (you can lengthen the log at this point if you like to get the diameter of cookie you want – this will give you more cookies too, if quantity is what you’re looking for). Seal down the ends. Wrap up with waxed paper and refrigerate for 1 or 2 hours. 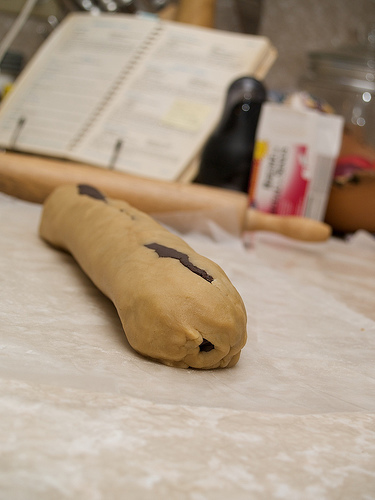 Using a sharp knife, slice across the cookie dough “log” to make each cookie, about 1/4 inch thick. 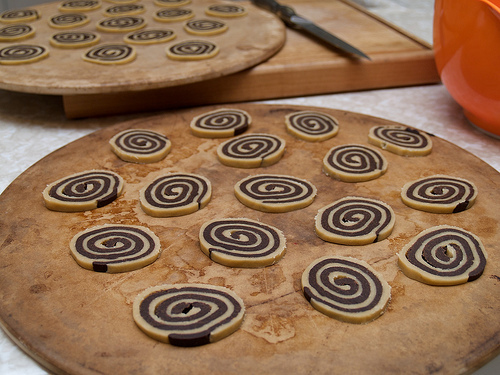 Lay on a parchment-lined cookie sheet (I used my stone baking sheets but they kind of stuck a bit so I suggest the parchment – it’s a winner every time with cookies). Bake for 8 to 10 minutes until just starting to brown at the edges. Yield: about 4 1/2 dozen.